If you run an e-commerce store, time and time again you’ll hear people telling you about the importance of Search Engine Optimization, or SEO as it is better known, for your website. But with new SEO strategies being constantly changed and developed, it can be hard to get your head around the whole concept. How do backlinks help with search engine rankings? Why do you need to use metatags? What’s the difference between off page and on page optimization? SEO may be daunting, but it’s really not as hard as people think. Admittedly, there is a lot of misinformation online and many SEO consultants who simply don’t know what they’re doing, but providing you do your research and keep a close eye on your data, it can be the difference between getting you on page one of Google and page 37. 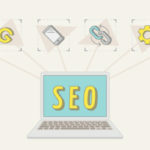 This helpful infographic by SEOJury contains answers to the most often asked questions among website owners and content managers, and topics like organic traffic, white hat SEO, Google algorithm, mobile SEO and more.